After selling over 100 million units globally, Nintendo's Wii console, launched in 2006, was always going to be hard for even Nintendo themselves to build upon. It's eventual 2012 successor, the Wii U, found itself lacking both developed third party support to attract all sorts of dedicated gamers as well as the casual appeal the Wii garnered so much acclaim over. Consequently, with just 13 million units sold in the past four and half years, the Wii U can be dubbed a huge flop for sure even if it boasted acclaimed first party titles like Mario Kart 8 and Super Smash Bros.
October last year saw Nintendo finally unveil their next system - the Nintendo Switch, known as the NX throughout production. Building upon the companies' growing interest in mobile gaming and the Wii U's feature of transmitting the TV images to a tablet-esque controller for limited portability, the Switch has been dubbed a "hybrid console" by critics and even by Nintendo themselves. This time, the console finds itself as a small tablet computer with a 6.2 inch screen capable of displaying images in 720p HD resolution - it's accompanying dock and controllers, dubbed Joy-Cons, allow gamers to hook it up to their TV for a standard home console experience (with 1080p visuals) or play it on the go in a number of ways. Mixed reactions were of course present following the announcement of such an ambitious concept, but now that it's finally here, how does it hold up? From left to right, we have the main console, the dock, and the Joy-Con controllers attached to their grip. First of all, what I'm happy to see with the Switch is that Nintendo is finally departing from the Wii brand. One key thing I felt contributed to the Wii U's failure was the stupid name which, aside from sounding dumb, of course made the console seem like just an extension of the Wii rather than a dedicated new platform - at least to the more casual crowd. The Switch's name is super brief and efficient, capturing the console's biggest trait in a neat little way, and allowing us to move on from the Wii theme to begin a new experience. The Switch can be played in many different ways: hooked up to the dock and played on a TV, removed and played with both Joy-Cons attached either side of the tablet, or placed on a flat surface, a built in stand able to prop the tablet up, and played with the Joy-Cons once again detached; consequently, they can either be used freely in either hand or connected to a bundled grip that matches a standard modern controller design. Said Joy-Cons can also be used as individual controllers among multiple people - turning them on their sides and equipping the bundled wrist straps allows them to essentially become mini game pads for use in a smaller games such as the launch title 1-2-Switch. They are also equipped with built in gyroscopes, once again allowing for motion controls, and so a wave of potential is created with this huge focus on flexibility. As for the handheld side of things, the system doesn't fail one bit, providing fully fledged HD experiences running beautifully in portable format, supported by a strong if sometimes inconsistent battery life. This is the main menu on upon turning on the Switch, with your available games easy to access and switch (sorry) between. The Switch isn't exactly huge on other features right now - stuff like Amazon Video, Netflix, or even a standard web browser can't be found from the get go, a concern which Nintendo has justified as them focusing on it being a dedicated gaming platform without distractions. Whilst this is respectable, it has to be said that in this day and age you expect these things to have the basic streaming apps and better internet access, so hopefully it won't be too long before updates introduce them - even Nintendo has assured us of this, to be fair. On a different note, it's also sad to see the loss of the much loved Miiverse from the Wii U and 3DS, with Nintendo instead wishing to focus on integration of existing social media websites - a smart decision, even if seeing Miiverse go is pretty lame. For now, you're of course only going to be using this thing to play games, and whilst the launch lineup hasn't won everyone over, there's some good stuff to explore upon purchase. The games are released as small cartridges this time round, inserted at the top of the console, though this thankfully never restricts the amount of content that can be packed into them. 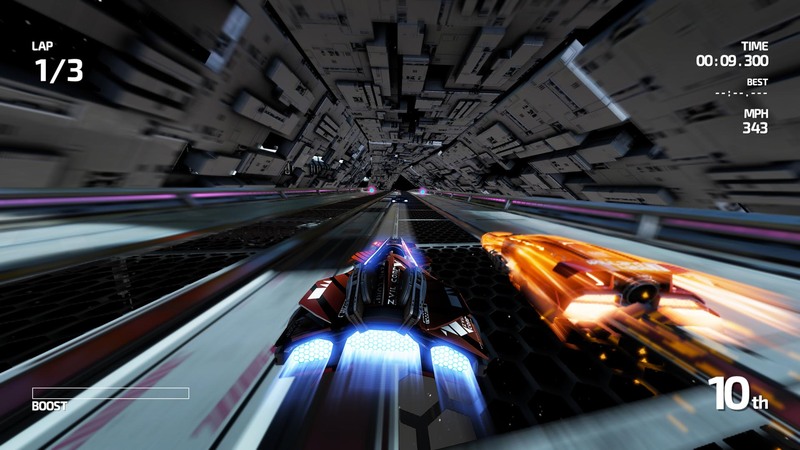 Fast is thrilling and looks amazing - though the difficulty spikes can be quite daunting. Physically, the console has a great, modern look and feel - the dock is mainly just a plastic shell with all the ports tucked inside, as the meat of the system of course dwells within the tablet itself. It may seem surprisingly heavy at first touch, so definitely be gentle, but it's overall feel is easy to get used to and definitely a comfy fit when playing on the go, Joy-Cons strapped to both sides - essentially feels the same as the Wii U GamePad. The touch screen is also capacitive, meaning multi touch gestures are now possible, which is a first for a Nintendo product, though definitely expected nowadays. A lot of people have made comments of scratching their screens when inserting and removing the console from the dock, but I myself haven't ran into such a thing - ensure you handle with care when doing this, as you should be with a near £300 console, and you'll be fine. The Joy-Cons themselves also feel great to hold, either when you're relaxing with them freely astray in both hands or when they're compacted onto the nifty controller grip that comes with the system. Nintendo have never messed up when it comes to controls, and that tradition continues once more. My past week with the Switch has been great fun - we're still in the early stages so not a lot of stuff has really come to fruition, such as Nintendo's extended online service that requires paid subscriptions. The eShop is of course up and running from the get go with a selection of launch games, including the aforementioned Fast RMX, but sadly the same can't be said for the Virtual Console - however, it's coming soon Nintendo have assured us, and with so many hints that Gamecube games will be available on it, to say I'm keen is an understatement. The Switch has opened to great success, becoming Nintendo's fastest selling system globally, and reaching just over half a million units at present. If Nintendo smartly handle the introduction of new content and memorable games over time, this successful launch can hopefully precede a stream of steady sales - and then we'll finally have a redemption for the Wii U's commercial failure.